A sea cave starts out as a weakness in a cliff. This is usually a fault line in the rock, an area of softer rock, or a crack where the waves hit the cliff base. Over time the constant action of waves against the cliff erodes more material from the weakened area than it does from the surrounding, more resistant, rock. The water in the waves contains sand and pebbles which abrade the rock, but the main erosional process is hydraulic action when waves hitting the cliff compress the air and water trapped within the weakness. Over time the sea continues to attack the weakness, enlarging the crack and eventually creating a cave. The cave will continue to be enlarged for as long as the waves can reach an area of rock that is weak enough to be eroded. If the cave extends upwards and reaches the surface inland from the cliff edge a ‘blow hole’ may be formed. Think of blow holes as being like pipes to the surface along which air and water can pass. As a wave crashes into the cliff base and compresses the air in the cave, it can escape through the blow hole as a blast of air and water on the cliff top. Sea caves, and blow holes, can become tourist attractions, drawing tourists to particular sections of the coastline. Cornwall is famous for its caves, including ‘Merlin’s Cave’ at Tintagel, and many caves rumoured to have been used by smugglers in the past. 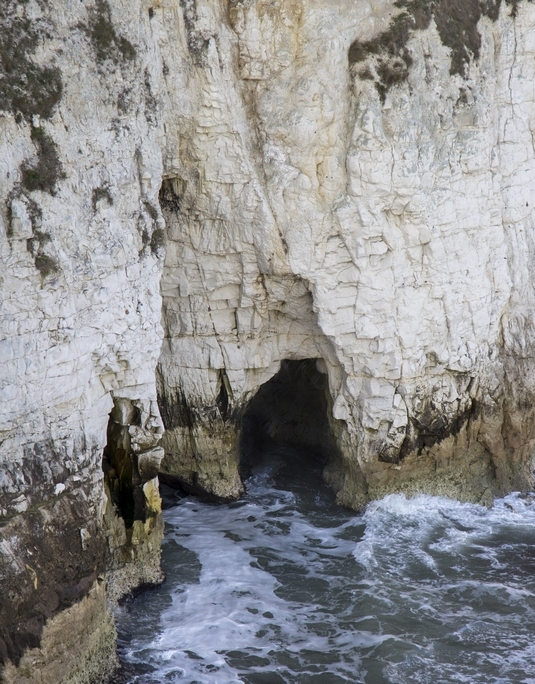 The photograph to the right shows the early stages in the development of a sea cave at the base of a chalk cliff. You can clearly see the weaknesses in the chalk, two diagonal cracks forming an ‘X’ shape in the rock. The shingle on the beach has been thrown, by waves, against the weakened rock and broken the chalk within the lower half of the ‘X’. 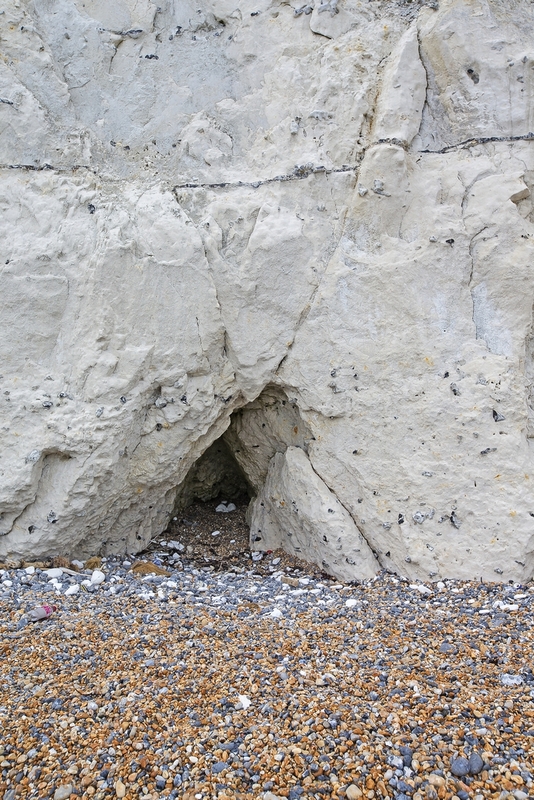 Parts of the broken chalk can be seen as rounded white lumps in the shingle around the cave entrance, suggesting that they were broken off not too long ago. Over time the cave will become enlarged, widening and becoming deeper due to attrition and hydraulic action. This will eventually leave the upper part of the weakness unsupported. The upper part will collapse due tothe lack of support, increasing the height of the cave. The process will continue for as long as the sea can reach the cliff base and erode the rock.